Please e-mail Mrs. Lopez for database usernames and passwords. Our library staff is dedicated to supporting the K-2 curriculum of the Commack School District. We strive to expose our students to a vast array of literature, reference materials, media and technology. We wish to instill in children the appreciation of literature, the ability to effectively use libraries and the tools to think critically throughout their lives. The staff of the North Ridge Library aims to implent teaching practices and library programs that address the abilities of all students to help them develop 21st Century skills. Students take out one book each week during their library time. Books are returned the following week. Reminder notices are sent out weekly. Students take a new book when they return the previous book. (Exceptions apply.) Please contact me regarding lost or damaged books. Are you looking for the perfect way to celebrate your child's birthday and give the gift of reading? If so, you may be interested in our Birthday Book donation program. 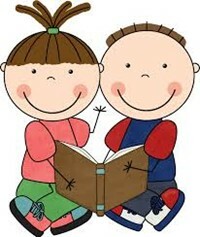 The North Ridge Library welcomes new book donation in honor of your child's birthday. We'll put a special bookplate inside the book that acknowledges your donation and display the book on a special birthday bookshelf for students to borrow. I also make a point to read the book to your child's class. Please feel free to contact me if you'd like book recommendations.